I grew up in Vermont and earned a degree in zoology from the University of Vermont in 1972. As an undergraduate, my primary biological interests focused on freshwater systems and I pursued these interests as a graduate student in the Department of Fisheries and Wildlife at Oregon State University. During my graduate school career, I married a fellow graduate student and co-participant in the FIRST II program, Mike Barton. As a dual-career couple, we came to Centre College in the late 70's where Mike was offered a position in the biology program. Since the 1980's, we have both been members of the biology faculty at Centre. I have taught a wide range of courses within the biology program, including introductory biology, evolutionary genetics, human biology, and freshwater biology. 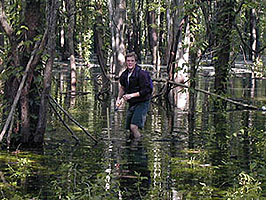 During the 1990's, I had the opportunity to take several groups of students on off campus biology trips to the Ecuadorian rain forest and the Galapagos Islands. Throughout my professional career, I have always had a strong commitment to improving the quality of science education at the pre-college. Specifically, I have coordinated a summer science camp program, science workshops for elementary teachers, and an ecology workshop for high school teachers. My research interests are focused on predatory and competitive interactions in fish. These research interests have led to numerous collaborative endeavors with Centre students over the past 15 years. I grew up in Los Angeles, California and received my B.A. from U.C.L.A. and my M.A. from California State University, Fullerton. I met my wife Chris while studying for my Ph.D. at Oregon State University. 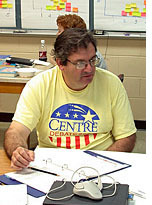 I am currently professor of biology at Centre College where I have taught since 1979. My teaching duties include introductory biology, invertebrate and vertebrate biology, comparative morphology, and comparative physiology. My research interests are in the ecological and physiological adaptations of fishes living in extreme environments. My graduate research was on fishes that live in the intertidal zone of the northeast Pacific coast. While at Centre, I have conducted a winter term off-campus program in marine biology at a field station on San Salvador Island in the Bahamas. Currently I am researching the evolution and ecology of pupfishes, small inhabitants of lakes and ponds in the Bahamas that experience rapid rates of speciation. In 1990, I received the opportunity to pursue study in another area of environmental interest, the landscape impact of the Spanish mission system of colonial California, when I received the Centre College Faculty Lectureship that year. A long-standing interest in automotive history has resulted in the restoration of a couple of old cars as well as the development of a winter-term course on the impact of the automobile on the environment. Currently, I am completing a textbook on the biology of fishes that will be published by Brooks/Cole in 2003. I have been a Visiting Assistant Professor in the Department of Biology at Centre College since 2001. I received my Ph.D. in Biology from Arizona State University in 1998. My graduate work involved the ecology and evolution of foraging behavior in tiger salamanders. 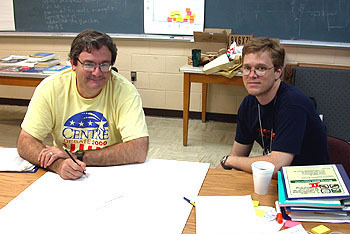 Before coming to Centre I was a postdoctoral researcher with Andrew Sih at the University of Kentucky. During this time I worked on mating behavior of water striders and aggression in crayfish. Currently I am interested in behavioral variation within and among species of crayfish in the genus Orconectes. 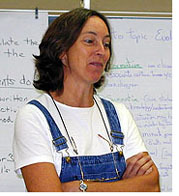 At Centre I teach courses in introductory biology, natural science for non-majors, ecology, and evolutionary genetics. I am interested in improving the field components of both my ecology and evolutionary genetics courses. I expect that I will come away from this experience with lots of good ideas for increasing my use of active-learning and field-based approaches. I received my BS in Biology from Univ of KY in 1975. After graduation, I spent a year and a half teaching biology to high school students in Zaire, came home and married. My husband and I were caretakers at the Central Kentucky Wildlife Refuge for 14 years while we raised our 3 children. As caretaker, I guided many school children and their teachers through the wonders of the refuge and led many wildflower walks for the general public. For the past 4 years, I have been working as the biology lab coordinator at Centre where I work with first year biology and biochemistry/moleculsar biology labs. I am presently working on a master's degree in biology from Eastern Ky University.